South Ossetian president Eduard Kokoity's exclusive interview with RT. RT: Did you ever think this day would come? Kokoity: Yes, our people strived toward this goal. We worked toward this goal strictly according to international law. However, Georgia found no other arguments except organising another aggression, another wave of genocide against the small people of South Ossetia. We proposed to the Georgian side and to the international community our own plan for a peaceful and civilized settlement of the conflict. But unfortunately nobody listened to our initiatives except for Russia, who is a guarantor of peace and stability not only in the Georgian-Abkhazian and Georgian-Ossetian conflicts but a guarantor of peace in the entire Caucasus region. RT: Apart from the support from Russia, where else do you see support, from which other countries? Kokoity: We think that all fair forces in the world should recognise South Ossetia. Today is a very emotional day for me and for all the people in South Ossetia and Abkhazia. It's a great holiday. It is a historic day. We all live in one world, and there should be the same approach to all conflicts, and the same principles of international law should apply to everybody. Today we celebrate our victory over double standards. This is the most important thing happening today. The great power that wanted to dominate the world single-handedly should now consider. Before the United States send its military to Georgia, it should consider. This is after it recognised Kosovo's unilateral declaration of independence. RT: Mr President, will your country recognise Kosovo? And will you have diplomatic relations with Tbilisi, if they permit it? Kokoity: We haven't recognised Kosovo yet, because we just got recognised ourselves. We would like to have normal, civilised relations with everybody. Now that Russia has recognised South Ossetia, I am sure that other countries will follow suit. Our new status means more responsibility for us. We want to meet all internationally-recognised parameters. We want to demonstrate to everybody that this is not accidental; this is an achievement of our people, something we have been working toward for many, many years. Today, historic justice was done. This is a great day for every Ossetians, regardless of where he is: in the United States, in South Ossetia or in Georgia. RT: Your country, South Ossetia, also has many ethnic Georgians. And the world will be asking you: how ethnic Georgians in South Ossetia are going to be protected after this terrible tragedy that we've seen? Kokoity: These are full-fledged citizens of South Ossetia. The Georgian leadership has launched “informational sabotage” against South Ossetia and Russia, trying to paint South Ossetia in a wrong way. All citizens of South Ossetia, regardless of their ethnicity, will live in a free, independent state. Today, we had about twenty Georgian families who say that want to return to South Ossetia. They became victims of Saakashvili's dumb and short-sighted policy. The Georgian people are not at fault. There were actually many ethnic Georgians who are South Ossetian citizens and who took up arms to protect the freedom of our country together with us. RT: What is your vision of the future of your country? How different it will be from the past? Kokoity: At the moment, I'm overwhelmed by what happened, and I cannot give you a detailed answer right now. We have been striving towards this, and we are ready for this. I’d like to say that we’ll continue building out statehood – and we actually had statehood. We’ve proved we’ve earned our independence. But we have to continue our efforts to perfect our statehood, and to adapt it, as a state which has been recognized, and in this way build our future relations with other countries. RT: What’s on your immediate agenda? Will you be now returning to Tskhinval today? Kokoity: No doubts, on this happy day I want to be together with my people. RT: You say “a happy day”, any plans for how the next days will unfold? What sort of ceremonies, what sort of events will we see in South Ossetia? Kokoity: Of course, today is a great day for South Ossetia. There will be plenty of celebrations. Yesterday, after the decision passed by the Russian State Duma and the Federation Council, people came out in the streets – the same people who just lost their relatives and were not supposed to be very happy – they went out to celebrate, so great their joy was. They were very emotional. The whole of South Ossetia was jubilant. RT: Mr President, Probably, the greatest happiness for you and the citizens of your country is that tonight they can go to sleep not worrying that they’ll be again attacked by Georgian forces? Kokoity: Today, the armed forces of South Ossetia, together with the peacekeeping forces, are doing everything to ensure the safety of the republic’s civilian population on the territory of South Ossetia. We don’t need to fear any further attacks. But, at the same time, knowing the true intentions of the Georgian president, and Georgia’s criminal leadership, we have to reinforce security measures to prevent any terrorist attacks by Georgia and other acts of sabotage on the territory of South Ossetia. In any case, they will try as hard as they can to rain on our parade. They’ve done it before, like when we celebrated the 15th anniversary of our independence. Tskhinval was bombarded amid the festivities. Tens of thousands of people were out in the streets celebrating, and at that time the city came under mortar shelling. In the same manner, the city was attacked when a delegation from Abkhazia arrived on a visit. This year, we celebrated the year of Moldova and Transdniester. And, during this celebration, and the expression of normal, human feelings, the city was bombarded. This makes us aware of the threat of provocation, and we’re thinking about this. So today, we shall be prepared for that, too. RT: Today is a great day for your country. When do you think any kind of reconciliation with Georgia can happen? Looking to the future, for everybody’s security in the Caucasus, what needs to happen for more reconciliation and peace in your neighbourhood? Kokoity: I think the recognition of South Ossetia and Abkhazia will aid in regulating the situation in the Caucasus. And I think, we should also think of building better, neighbourly relations with Georgia, but not with the criminal leadership which the country has now. We express our sincere condolences to the Georgian families which have lost their sons, brothers and husbands. We’re sorry, but we didn’t start this. We did not start a war on Georgia. Today. the people of Georgia have to ask their criminal leader why he chose this path, leading the hordes of well-trained and well-armed Georgian soldiers against peaceful South Ossetian villages. Each of us was defending his homeland, and that’s why we won. We won because we were right. RT: How will you build your ties with the countries who do not want to recognize your independence? Kokoity: We understand the current situation, but I think Western countries which refuse to recognize South Ossetia are not acting in accordance with international law. They’re mostly pursuing their own geopolitical interests. We understand this, but there will be a day when we’ll be able to prove that the recognition of South Ossetia was no mistake. Our republic is a state, and it deserves its independence. We proved it long ago. And we will prove it once more, acting under the international law and the recognized legal norms. We will do this in a civilized way. We know this is not an easy process, but in any case, we’re a part of the international community. We are a part of Europe. And we’ll do all we can to follow the existing standards – except for the policy of double standards and the cynical attitude which today, regrettably, prevails in the Western politics. RT: Will there be the Russian military base beyond peacekeepers in South Ossetia? Kokoity: I’d like to say it again – Russia is the most important state in the Caucasus region. Today, the peacekeeping actions of Russia, aimed at preventing aggression, have been timely and vital. Taking into account the interests of countries which do not know a lot about Caucasus, don’t understand the Caucasian mentality, but want to pursue their own policy in the regions, we believe that Russia must always keep its strong stand in the Caucasus. Only then will there be peace in the region. As for South Ossetia, we’ll continue developing relations with the Russian Federation, including in the sphere of military cooperation. I’d like to officially stress that we’ll be happy if Russia decides to place military bases in South Ossetia. 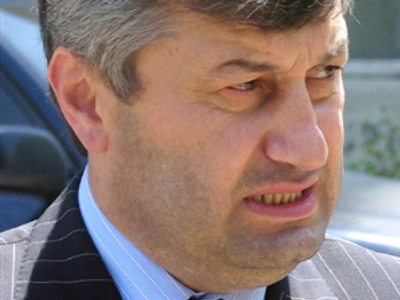 This is the opinion of the president of South Ossetia.